Deer tick identification is important to understanding what to look for to help prevent a possible long bout with Lime Disease. Deer Ticks, also known as Black Legged Ticks, take 2 years to complete their life cycle and are found predominately in deciduous forest. Their distribution relies greatly on the distribution of its reproductive host, white-tailed deer. 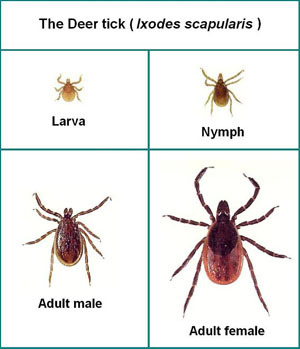 Both nymph and adult stages transmit diseases such as Lyme disease, Babesiosis, and Anaplasmosis. Adult males and females are active October-May, as long as the daytime temperature remains above freezing. Preferring larger hosts, such as deer, adult deer ticks can be found on the tips of branches of low growing shrubs and grasses. Adult females readily attack humans and pets. Once females fully engorge on their blood meal, they drop off the host into the leaf litter, where they can over-winter. Engorged females lay a single egg mass (up to 1500-2000 eggs) in mid to late May, and then die. Larvae emerge from eggs later in the summer. Unfed female deer ticks are easily distinguished from other ticks by the orange-red body. Males do not feed. The six-legged larvae are active July-September and can be found in moist leaf litter. Larvae hatch from eggs, and remain in the leaf litter where they will attach to nearly any small, medium or large-sized mammal and many species of birds. Larvae remain attached to their host until completely fed, which usually requires 3 days. Once fully engorged, the larvae drop off of the host and molt, re-emerging the following spring as nymphs. Nymphs are active May-August, and are most commonly found in moist leaf litter in wooded areas, or at the edge of wooded areas. The eight-legged, pin-head sized nymph typically attaches to smaller mammals such as mice, voles, and chipmunks, requiring 3-4 days to fully engorge. Nymphs also readily attach to and feed on the blood of humans, cats and dogs. Once fed, they drop off into rodent burrows or leaf litter in animal bedding areas where they molt and emerge as adults in the fall.